Onboarding is important! I don’t think it’s necessary to argue that point. If you need validation, check out this Forbes article. It comes down to the simple reality that we’re all trying to attract the best talent. We’re all having turnover problems. We’re all hiring new people. So why are we all so bad at getting those new people up to speed in their new roles? Why are we still doing things like throwing people into the job without support or shoving them into back rooms to gorge on 20 hours of eLearning? Onboarding is one of those corporate concepts that everyone acknowledges as critical but no one seems to really take seriously. It’s not like we’re wanting for resources on the subject, either. There are plenty of articles out there about improved onboarding practices. Here’s one from When I Work. Here’s one from Zenefits. Here’s another from Glassdoor. And searching Amazon for books about onboarding yields 213 results. Some of these resources include great insights. Others just repeat the same tired ideas over and over to get some site traffic. But, if there’s already so much information out there to help us, why do we continue to fail our new employees by providing inadequate onboarding experiences? Even the best tactics fall short when onboarding is structured like a “program” that has a pre-determined start and end. The organization’s relationship with a new employee begins well before they walk in the door on the first day, and the journey to become a 100% capable employee never ends. Sure, people who are new to the company have certain needs that are likely irrelevant to established employees, but the ways we support those needs don’t have to change radically just because a person just got hired. Therefore, rather than build onboarding programs, we must foster an ecosystem of continuous enablement that always provides the right support at the right time for our employees, regardless of their tenure. That sounds great! How do we do that? Well, that’s a lot BIGGER question than I can address in a single blog post. Since no one has offered me a book deal yet (cough cough), I’ve decided to cover this extended topic in the best way I know how: BLOG SERIES!!!! I’ll also share stories from organizations that have been able to get their new employees up to speed more quickly, realize awesome performance and sustain their development by shifting their onboarding mindset. I’ll also share a few anecdotes from my Disney decade, some magical and some not quite up to Mickey standards. Along the way, I want to hear about your onboarding stories. Where are you seeing success or challenges within your current onboarding approach? Did you have a particularly good/bad onboarding experience yourself in a former role? 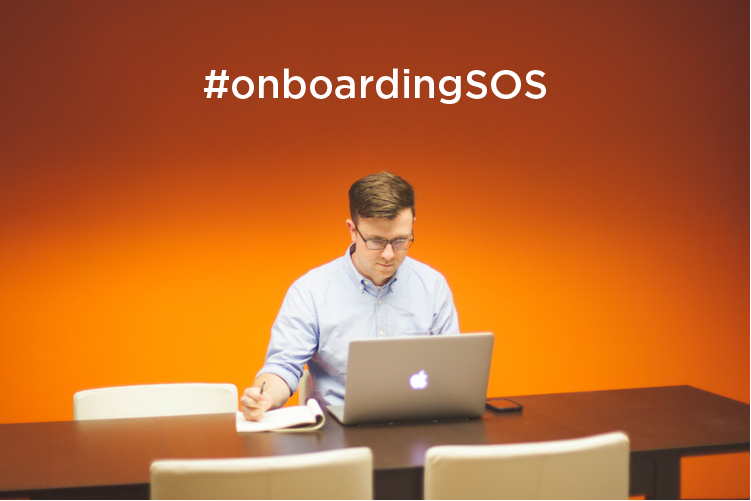 Share your stories in the comments below or tweet using the hashtag #onboardingSOS. I hope you’ll follow along as we work together to reimagine the concept of onboarding within a modern workplace. Subscribe to our blog to make sure you know when our latest post hits the site. Our goal will be to make sure your employees feel just as supported on their first day on the job as they do right now (because they’ll be more likely to stay with you if they’re well supported)!